A little over three months ago, we introduced something new called Inbox, and it’s been exhilarating to see how people have embraced the experience. In fact, we’ve received over 100,000 pieces of feedback already. Thank you! As we keep working to evolve Inbox based on your feedback, we thought it’d be fun to share how people are currently using the product to get things done, and focus on what really matters. Enjoy! And one more thing. We're opening up invites to Inbox for a 24 hour #InboxHappyHour! If you're interested in trying Inbox, send an email to inbox@google.com from an @gmail.com address before 9am Friday PST and you'll get an invite shortly. Snoozing the alarm in the morning is so satisfying. You get those extra few minutes of sleep without worrying you're going to miss anything. That's exactly what snoozing in Inbox is like. Whether you're in an inconvenient place or simply need to focus on something else first, you can snooze away emails and Reminders to a better time or place without worrying you're going to forget. For example: maybe today’s crazy busy, but you still want to get back to your New Year's Resolution to clean the garage— whether that’s tonight, tomorrow, or next week. 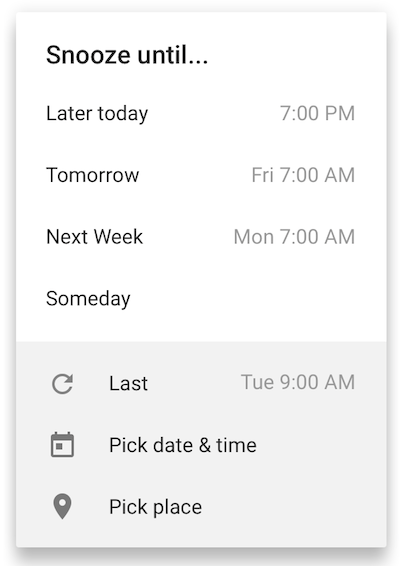 With Inbox you can either snooze using the convenient quick options or by setting a custom time. Inbox responds to your preferences, and adjusts its quick options to match. Sometimes it makes more sense to snooze your emails to a place, instead of a time. For example, you might want to snooze your ticket to the game, a reminder to buy milk to the grocery store, or even the article Mom sent you to when you get home. Once you start snoozing, you'll notice that Inbox can make the entire process a whole lot easier. 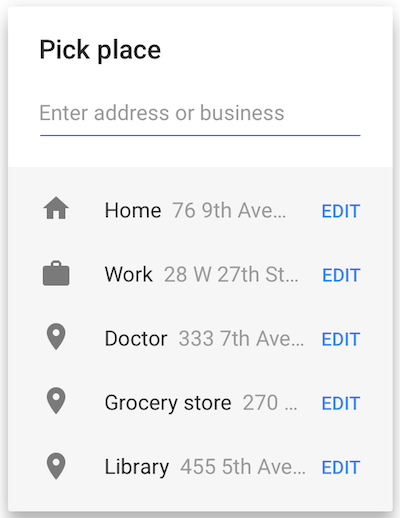 For instance: you can name and save common places. And if, say, you've resolved to call your Mom more this year, you can just create a reminder. 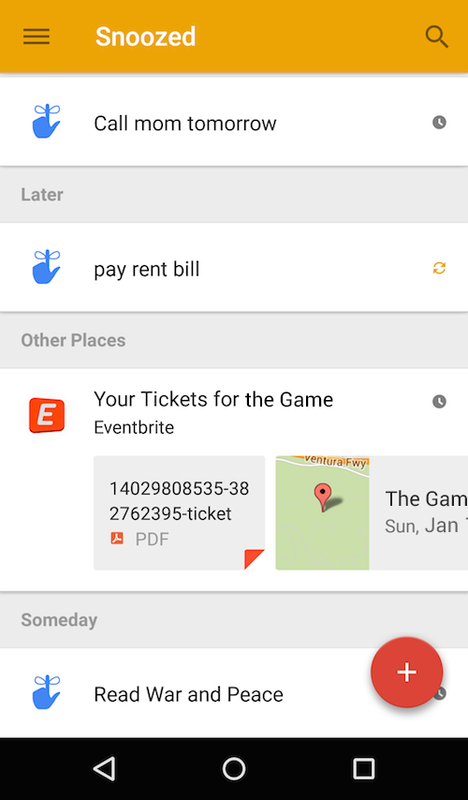 Inbox will help you snooze to a time or place with Assists. Ultimately, Inbox is about helping you get back to what matters. So give Snooze a try, and take back your inbox this January.